Young catcher Eddie Leneve was the first professional ballplayer to be killed in action in the Korean War. Edward C. Leneve was born on October 25, 1929 in Richmond, California. 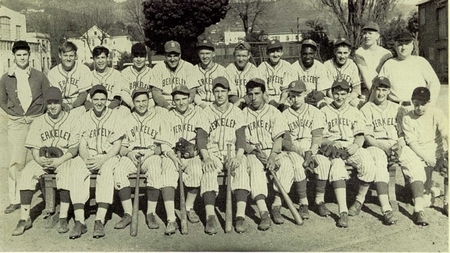 He attended Berkeley High School, where he played baseball alongside future major league second baseman and manager, Billy Martin, and helped the school to the Alameda County Athletic League championship his senior year, 1947. Leneve was named to the ACAL second team that year. The 5-foot-9, 195-pound catcher signed with the Oakland Oaks of the Pacific Coast League in June, and was farmed out to Phoenix Senators of the Class C Arizona-Texas League. He saw very limited playing time at Phoenix but was back with the Oaks for spring training in 1948, getting two hits in a practice game against USC on February 28. Leneve was assigned to the Stockton Ports of the Class C California League at the start of the season but joined Visalia (a Chicago Cubs farm team) of the same league midsummer. In 41 games, the 18-year-old batted just .128 (14 for 109). Leneve entered military service at the end of the season and served as a private First Class with 1st Battalion, 7th Marines. On September 21, 1950, the 1st Battalion made an amphibious landing at Inchon, Korea, and took part in operations such as Hook, Reno, and Vegas. On December 2, 1950, Pfc. Leneve was killed in action during the Battle of Chosin Reservoir - a brutal 17-day battle in freezing weather against Chinese forces. Edward Leneve is buried at Arlington National Cemetery in Virginia. Memorial Section F, Site 46-A-4.